We have collected ski resort information on the best and most easily accessed ski resorts in Canada for our international guests. Whether you are looking for extreme terrain, the best snowfall, the best for families or ski resorts which offer it all, we can help you find what you are looking for! When you pre-book your lift passes through us as part of a ski package, we offer "kids ski free" at the following ski resorts: Banff Norquay, Jasper Marmot Basin, Lake Louise and Sunshine Village. 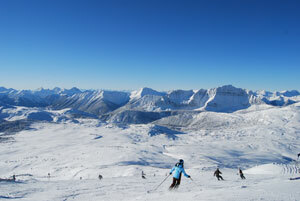 We also offer "kids rent free" at select ski resorts in Canada, please contact us for details. Most of the other ski resorts work with us on similar ski promotions so please contact us for the latest ski deals!